Since my exposure to live coverage of the Tour De France in Greece has been restricted to occasionally popping down to a nearby bar which shows Eurosport on satellite, I've mostly been following the now drugs-tainted 2007 edition on the internet. This week I've been reviewing the sites that I have been using, and have so far looked at the official site, state and semi-state broadcasters France 24 and The BBC, The Guardian, The Telegraph, and Eurosport's online partnership with Yahoo! In the course of putting this series of reviews together I looked at a few sites that I expected would have extensive coverage of Le Tour, but didn't. For several months in 2006 when I was travelling through Europe with my wife, CNN was pretty much the only worldwide sports bulletin we got to see, so I thought I would check out their coverage of the Tour De France. Whilst I have generally been impressed with their recent site redesign, the Tour De France doesn't seem to have blipped very large on their radar. 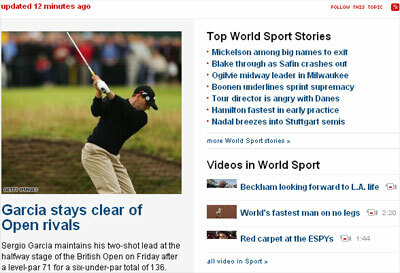 One of the things I like about the new CNN site is the 'topic' style navigation at the top of the page they have. This looks like a cross between an editorial pick and a 'people are looking at' list, and supplements the primary navigation across the categories of the site. However, at the time I was reviewing the CNN site, the Tour De France didn't even make the list of 'topics' on the sports page. CNN's coverage seems restricted to posting a few stories. There doesn't appear to be any direct video reportage, and there is no guide, dedicated homepage, or blog-type content from a correspondent posted to the tour. Given that both The Telegraph and The Guardian have done a considerable amount of Tour De France coverage, I thought that The Independent, seeing itself in the same market, might have competed. However, that doesn't seem to be the case. In fact, on the days I was looking at the site, it seems that one of the hallmarks of The Independent's "serious" status is that it relegates the sports stories on the online homepage to being well below-the-fold. In fact, I suspect The Independent may be the only newspaper with an online edition that places Obituaries higher than sports news on their homepage. The Times was another location where I thought that I might find some quality coverage of The Tour, but was disappointed. On a busy sporting weekend Formula 1 and The Open justifiably nudged their way into The Times contextual sports menu, but despite a Beckham fuelled appearance for 'U.S. Sport' there was no place for cycling or Le Tour. This was further evidenced by the fact that The Times was providing live coverage of The Open and the Test Match, but not of the cycling. Tomorrow I'll be wrapping up this series of posts about the Tour De France as the race reaches what will now be a downbeat climax on the streets of Paris, as I present my Général Classement. By Martin Belam on 28 July 2007.
poor effort of a website!